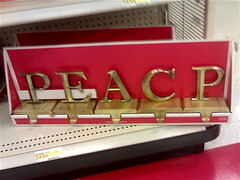 I was walking down the aisle at Target the other day when I saw this set of Christmas stocking hangers. At first glance, I thought that they were just rearranged by a prankster, but if you look closely, you can see that all the letters are attached to the box by plastic zip ties. I checked, and all of them were quite firmly attached. If there is a prankster, he or she managed to replace the zip ties and fasten that P in there firmly. Or maybe this is another case of poor quality control. 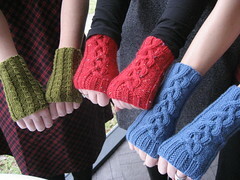 Amanda (“Dixie Cupps” on Flickr) has knitted up several pairs of wristwarmers from my patterns. Here are three of them in action. The two pairs on the right are the Warm Braid Cable Wristwarmers, and the green pair on the left are A Little Twist Wristwarmers. They are all beautifully knitted and look great! Thanks for posting the photo, Amanda! 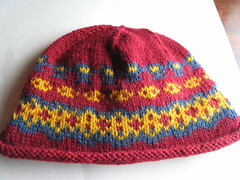 Last year I designed Madison’s Hat, a simple two-color hat in bulky yarn that is an excellent project for learning stranded Fair Isle-type colorwork. This is essentially the same as Madison’s Hat, but the addition of a third color makes it slightly more challenging. Not too much, though, because no row has more than two colors, and the floats are very short, as they were in the Madison Hat. Download the W Hat pattern (PDF) here. This pattern is Worthware — that means, if you like it, please send what you think it’s worth via the PayPal button here. I hope you think it’s worth something. Thanks for looking at my pattern! Minor errata: If you downloaded the pattern before December 17, 2007, you should download the fixed version. The old one suggested that leave the hat on the circular needles until you decrease to 54 inches, then change to dpns, and this is not correct for this hat. Most people would probably figure it out anyway, but to be safe I’ve edited the pattern to fix this. The new pattern says “W Hat v2” at the bottom of each page. One of the original Seattle bloggers, Anita Rowland, lost her battle with cancer yesterday. She was the host of the Seattle Weblog Meetups, and one of those people that it seemed everyone knew, either through blogging or through her activities in SF fandom. On Metatalk, Dylan said “She was a connector. Were it not for her, I wouldn’t know at least a dozen people here in Seattle. She was the ‘den mother’ of us Seattle bloggers.” And that is the truth.